In the past year, a comic book has sparked conversations between my 14-year-old son and myself about the poetry of William Blake, Paradise Lost, and moral conundrums in the Bible. Just last Saturday, this title caused us to discuss how the culture seems to be more forgiving of our anger as white males than of anybody else. Coming out of a weekend where my social media feed has been aflame over dismissive comments about comics by a well-known HBO comedian, I thought this more than a little ironic. The book that has been guiding my son into reflection, unease, and still much cathartic enjoyment: The Immortal Hulk. 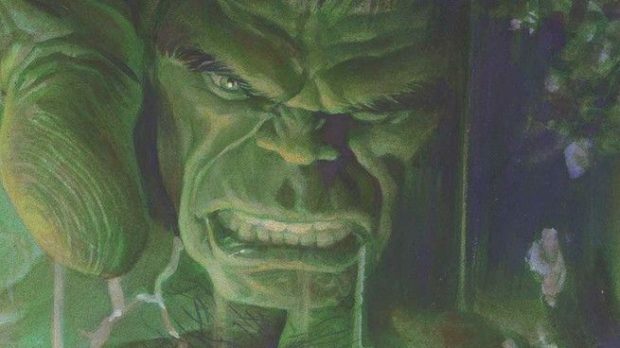 When first conceived, the Hulk was a monster. 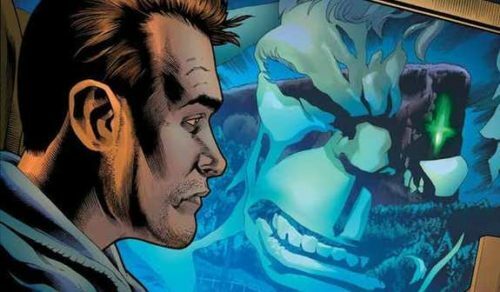 Inspired by Robert Louis Stevenson’s The Strange Case of Doctor Jekyll and Mister Hyde, the first six issues of The Incredible Hulk flounder about trying to find the right elements to make the character last. He transforms at night, then when he’s angry. He’s grey, then he’s green. He’s cunning, then… well, he stays intelligent in that initial run (and in The Avengers), and then becomes the unleashed id that fans of the CBS television series came to know, and who he’s slowly evolving from in the Marvel Cinematic Universe. 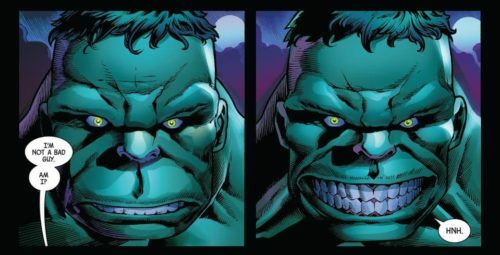 The one constant in the various takes on the Hulk over the past 45 years or so has been that he kind of cycles, and each relaunch and revamp shifts the lens a bit on what Hulk is. Writer Al Ewing and artist Joe Bennett have shifted it back to the monster, and magnified it. 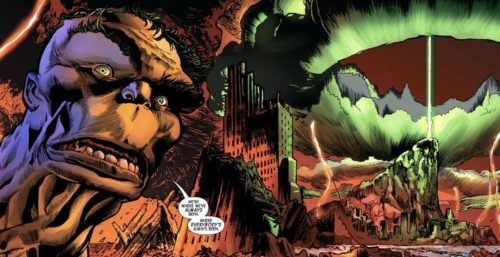 Though still nominally a superhero book — if at its best the Hulk ever is — The Immortal Hulk focuses on a resigned Bruce Banner. He’s struck a deal with the raging voice inside his head, because he had no choice. As Mark Ruffalo alluded to in the first Avengers film, you can’t really kill the Hulk, even when you kill Banner. Every night, the angry green behemoth rises, particularly angry if during the day, someone has killed Bruce Banner. Banner has just enough sway with the Hulk to mostly turn him toward justice, but in the loosest sense. And something else wants to use the Hulk, always lurking at the edge of perception and on the other side of a door in reality. Familiar characters weave in and out of the story, including the Avengers, but Ewing and Bennett stay on a dark unsettling path. Each issue begins with an epigram, hence sparking the conversations about other literature. It could be a pretentious touch, but it only adds to the ominous creeping dread as both the truth about the Hulk and his unseen adversary unfolds. By last week’s issue, #12, Ewing even provides a little history lesson on the mythological evolution of the Adversary himself. Something big is brewing, and like Planet Hulk, this is a run that will reward reading again and again. It’s clear that the creative team is spinning an epic tale that will stand out from the decades of a character’s run. The Immortal Hulk builds from Lee, Kirby, and Ditko’s groundwork, taking a few pieces from Peter David and Dale Keown. But what it will turn out to be is its own masterpiece.